Morning starts in Simon's Town with some builders trying to open the door to my room to get out on to the patio. They find another way, and start drilling and cutting up wood. I’ll get up then, I suppose! After finishing the pizza leftovers I head out, leaving my pack, to a nice little patisserie just along the road for coffee. Despite the pizza I manage a chocolate muffin too with the coffee. Quite some breakfast! So I’m taking a train to Clairmont, half way back to Cape Town. No one checks the tickets as usual. It does seem like first class is mostly women, all the guys are in 2nd class, which is fine by me! Oliver greets me at the station, we drop my bags at Gerhard’s house and head out to a café for some beers before the big G comes home from work. He hands Oliver some beers, to which Oliver asks whether we’ll pick up beers at a supermarket on the way? Oh yes, says Gerhard, these are just for the road. Good work fella! On the way we pick up a large snoek fish for the bbq, and plenty of booze and other food. He drives us round the coast to Betty’s Bay, described in LP as a small scattered holiday village, which turns out to be a wonderful place. It’s one of the popular places to own a holiday home. Gerhard’s family home is called The Dory and is on an unmade road just past the Botanical Gardens. It sits surrounded by trees and bushes, with an unobstructed view of the sea, and just scrub vegetation between the house and the rocks. There’s a small sandy beach a few minutes walk towards the village. The house is a lovely traditional seaside town. We’ve got a room each – apparently 30 people have been accommodated between the house, annex and wooden chalet hut which sits in the garden! The braai (just means "bbq") area is basically a stone circle in a sheltered spot in the garden. It’s warm, sunny, but we’ve got no time to mess about, the water beckons! So quick beer consumed, swimming gear on, we follow Gerhard down on a rough path which beats down to the water’s edge. It's rocky here. The plan is to go for a swim and collect mussels. where on earth are we going.. It's hard going, and Olive remarks that he originally planned to come down here without shoes on. Not an option! As we get closer to the water it's apparent that there is a fair swell going - you don't realise from higher up, all looks calm. Wrong! We have to pick our way over the rock pools to get down, including some nice slippery sea-weed coated rocks that my ice-skate Crocs just soak up. Gerhard beckons us over into the next pool, apparently the spot to find mussels. 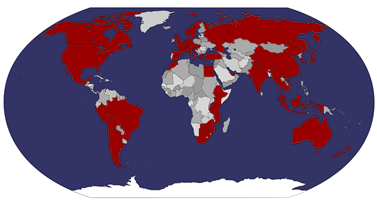 Swimming in the open sea has been shelved for life-preservation purposes. The problem with this spot is that we are well within range of the bigger boys rolling in. RETREAT!!! I head into the pool and don't listen to Gerhard when he says "Back up" quietly. He then says it louder. I look up, just in time to see the impending disaster! I get thrown into a rock pool, and for my sins pick up a grazed shin, but all things considered this is not bad. Oh, and my camera gets soaked. I was half way through putting it into the waterproof bag I have. But it wasn't in when the wave broke. Crap! It later turns out it's pretty much dead from salt, added to the lens scratch. Back to the SLR only for a while then, sigh..
We hop into the mussel picking pool. I head in first. It's not big, but deep enough for a big dive-bomb leap. It's FREEEEZING! I make a bee-line to get out as soon as possible, and am accused of being a wimp. Fine, in you go then. As Oliver and Gerhard scrabble to get out, no more is said about the matter. Oliver and I pick in a pool which has a large sheltering rock we can dive behind next time a big breaker comes in. Gerhard keeps watch. Soon we have a bag full of several fistfuls of mussels, which combind with our snoek should be plenty. We head back up to the hosue to start on the braai. First comes the fire, using the packs of logs we picked up earlier. Preparations are not strenous, just involving bringing out table and chairs, makin up the (bag) salad, and Gerhard preparing the fish fillet with jam as well as the usual savoury condiments, before wrapping it in foil. Before starting on anything more exciting, Gerhard makes toasted cheese sandwiches. Apparently this is *the* thing to do on a Braai. Cheese, sliced tomato and onion toasties. It seems so strange, as a precursor to a braai with fish, meats, shellfish etc, you have a cheese and tomato sarnie! But traditions must be upheld! Oliver is reluctant to tinker with the fire, recognising it to be the host's domain, but of course those masculine desires are hard to surpress. Gerhard makes a start on the nice Chenin Blanc, the most popular local grape varietal. Th finished result is marvellous. We have the mussels first, with some salad. They don't come much fresher than these, these babies were alive ten minutes ago! If this were Korea they wouldn't cook them of course! After dinner we decide to headout to some pubs to see if there's anything goig on, it is Halloween after all, but it seems everything is closed, even the notorious and cheesy venue of Camelot, so we come home again and carry on with beer, the wine having finished. The night ends on a musical note, with Oliver producing his "The Last Waltz" DVD, and me my "Thelonius Monk" equivalent. Preaching to the converted all round, but still fun. We finish a few more beers, and wonder how we'll ever get up the next morning for the unlicenced fishing as discussed. My head hurts. It’s six something, and Oliver wakes me up, time for fishing apparently. I beg your pardon? I remember the line in King of the Hill – Hank says “I have never got up that early in my life when it hasn’t involved fishing”. Oliver’s made me coffee, but I’m not sure I can stomach any yet! We grab our rods and head out. I’m out of the house first, and am rewarded with an absolutely enormous whale diving right in front of us – must be twenty yards off the beach. Oliver doesn’t believe a word of it until he surfaces again, or rather sits just under the water. He’s a beauty, absolutely enormous – it honestly looks like there’s a submarine floating in front of us. The Southern Right Whale is the most common around here, but Humpbacks and Brydes are also seen. We potter down the rocks to where we were yesterday. There’s a fairly big swell going. We hit the small rocky outcrop and gear up. We’ve both cast off a couple of times without getting jammed when the most enormous wave comes through. We see it but don’t realise the consequences until large volumes of water are flying straight at us. Soaked. And in my clothes. Dammit! At least we weren’t knocked off, which was a real possibility! When Oliver’s hook gets caught somewhere, and we’ve been soaked again, we give up on the full frontal approach, and retreat to a small tidal pool which is more sheltered. Oliver takes my rod and some cheese and manages to catch three little blighters. We take two up because presumably Gerhard wouldn’t believe us. He tells us over coffee that he’d definitely believe us if we said we caught a couple of poor little rock fish! Time to leave the lovely Dory House. Gerhard has to work, Oliver has a flight to Durban, and I’m heading back to Cape Town. We drive along the coast, seeing some seals rolling about in the water, then drop Oliver first, and say goodbyes. I might be able to hook up with him again later somewhere in the East of the country – it’s certainly been a lot of fun hanging out. Next Gerhard drops me at Bellevue Station just near his office. He’s only got minutes to get there for a meeting, so a brief goodbye and thanks and he’s gone, leaving me feeling quite nervous – it’s a crowded transport interchange, with buses, mini-buses and trains, no white people (of course) and I stand out like a sore thumb with my backpack. I feel a bit nervous – I hate looking like a big useless whale, something exaggerated when I’ve got my daypack on my front too. Anyway, I get a ticket, first class (so-called), and find platform 11, with about five minutes till the train arrives, which it does, on time. I realise at it comes in that the only first class is right at other end of the train. It’s not really feasible to walk between carriages with this pack, so I run, but the train only stops for about 10 seconds. Missed! Of course, the next train is late, so I wait on the platform listening to music hoping the sun will dry out my still damp clothes. A ginger haired chap comes up to me and says something. (Internal sigh, headphones out). He asks me if I’m backpacking. Yes. Where am I from. England. Where am I going? (Threat level raised to orange) Cape Town. Where am I staying? Long Street? (Threat level up again). Why is this guy asking me all these questions? And then it comes out, he’s American, has a long sob story, been robbed, but has some dollars, wants to change to SA Rand. Shows me a cut on his hand which apparently just happened. It all sounded interesting, but for one small consideration – he reeked of alcohol. Can I help him? Nope, sorry. He doesn’t seem to believe it. Well, I’m not marching into some scam, and if you’re a genuine story get your consulate to help out. Sorry chap. You do get this sort of approach a lot in South Africa. I don’t know how many are genuine, but I’m feeling vulnerable enough myself, without getting involved in anything like this. The train finally arrives, and I’m at the right end for “first”. By the way, let me explain – first class is anything but. As far as I can see all it means is a slightly more expensive but still dirt cheap form of transport – same carriages but the extra charge seems to deter the majority of (black) travellers into the 2nd or 3rd class. To me there’s plenty of room, I don’t need to worry about my pack, whereas the regular ones, which look the same in all other respects, are pretty busy, which would just make me feel a bit more uncomfortable. And as for it being First Class comfort? The windows are so filthy I can’t see anything at all, not even what station we’re arriving at. In Cape Town I’m on home ground, so march straight up back to Carnival. I asked for the same room, thinking of my precious open wifi, but it turns out the room is full, and because of someone abusing the access (big downloads etc), they’ve locked it down, dammit! Well, don’t need the same room any more then. 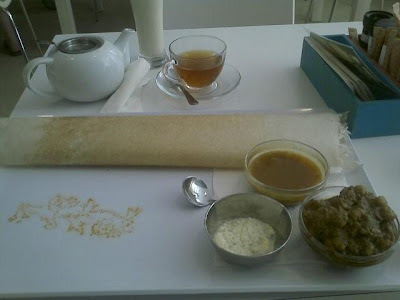 Lunch at Masala Dosa in Long Street is a good sized plain dosa, with side pots of lamb curry, and a couple of sauces. I pay extra for a chilli pickle. It’s not bad, but the dosa isn’t as light and fluffy as those I had in India. Plus ten times the price – my, I can really do the India vet thing now, can’t I! The lamb is good though, and washed down with a pot of tea and a banana lassi. Back for blog marathon and perhaps a snooze. I wonder if Lewis’ Mama Africa will ever be open! !